Looks like singer Ariana Grande is going have a specialty doughnut named after her. It is “dripping” with goodness. The “most moist donut” you can find. OK kidding aside, Ariana made news this week having been caught with her boyfriend licking donuts in a store. See the details and the video at TMZ. Seems she went further stating “I hate Americans. I hate America.” That got the net in an uproar. Her spot at the All-Star Concert in Cincinnati was given to Demi Lovato (Grande claims last minute oral surgery was to blame). Now to her credit, I believe Grande when she explained that she was talking about our obsession with food was where her comment was emanating from. Yet she never did say anything about french kissing the French Cruller. I didn’t even know who she was. Still don’t care either. If she hates America then get in line, there’s a bunch that do. I don’t eat donuts, but if I did I think I would quit after seeing that. Gross. I guess licking other peoples food is a thing that they all do in her country. Noooooo! Bearman, the Bringer of Truth has revealed that Ariana Grande is a “He”? Well, no more licking my donutses, Ariana! Or Ariano, or whatever your real name is! I avoid TMZ since I believe it has added to America’s decline. Do I really care what a pop singer has to say at a doughnut shop? Only if she is calling me over to give me some donuts. My mom’s husband calls donuts “Happy Pills.” Bear claws are not Bearman’s hands. Ariana Grande looks like a middle schooler. End random transmission. Aggghhh!!! Tell me she didn’t do that…! Have no idea who she is, but I’ll take a dozen unadulterated doughnuts. Better make that a dozen dozen. For the record, I tried the same thing at my local dunkin donuts and the consequences were considerably more severe. It’s like the old saying goes.. “Ariana Grande can do things to donuts that you can’t.” I never fully understood that until now. 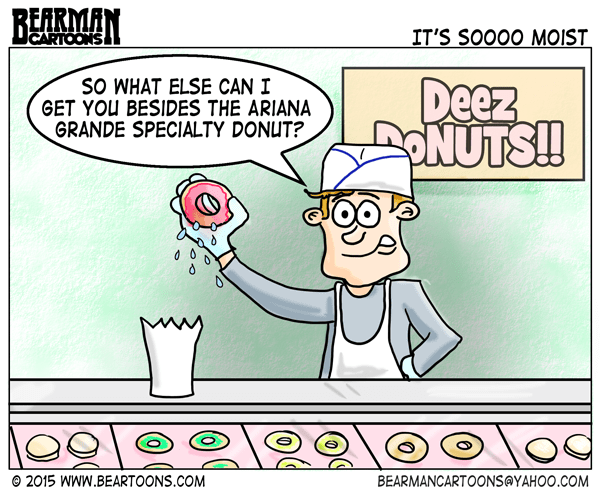 Ariana Grande Donuts: good to the last drop! Good luck with your Donut Shop, Bearman, althought I usually Donot shop for donuts. She can’t be too famous as I’ve never heard of her but I do like donuts. Love the name of the Donut shop too. Open mouth, insert foot donut. I agree with you, Bearman, I think she was just talking about America’s obsession with food. This isn’t the first time a ditzy pop star made a slip of the tongue.